Despite the transformation of the once infamous Barrio Chino (Chinese District) of south El Raval with projects like a 5-star hotel or the National Film Library, there are still "risks to some public space" from prostitution, crime, drug addiction and begging, according to a document prepared by the District Council. The area of South El Raval is no longer a forgotten part of Barcelona's Old Town. The district has begun to develop projects including the new Catalan Film Library and 5-star luxurious Barcel� Raval hotel which will open on September 24, 2008. The hotel offers one of the most spectacular views of the city, 360 degrees of Barcelona without obstacles. From the hotel�s roof terrace, it is difficult to make out the top hot spots of social conflict that still exist in some of the alleys and squares of the neighbourhood. The street behind the Barcel� Raval hotel, Sant Ramon, is a meeting point for prostitutes and drug dealers. Enric Mons�, a neighbour of this part of town, says he has lived here for 53 years and now sees people of all colours - black, brown and white, a lot of variation. People in the neighbourhood have always had a different style of living, he suggests. Another neighbour, Marina Balboa, explains that they have a very high crime rate in the street but most of the people are very good. It is the bad people who bring the prostitution. Other areas of South El Raval are equally uncomfortable. Pere Corominas square is another zone that has been designated for preferential urban reform, and has become a no-go area for the police. Saira, another neighbour, mentions that the district was better in the past. There were not many innocent people, but they were honourable. Barcel� Raval hotel is located along a new pedestrianised street, Rambla del Raval. A few metres away are the gardens of St. Pau del Camp, one of the areas that people believe is made unsafe by the presence of drug addicts. Neighbours hope that with the new infrastructures, things will improve. Marina comments that it would be marvellous area, but the only way would be to clean up the neighbourhood. Saira suggests that the 5-star hotel, is very expensive, it's for the rich. People in the neighbourhood can't afford to pay 90 euros* a night sleeping in a hotel. South El Raval is a neighbourhood that brings together people with few economic resources, transitory immigrants and now wealthy tourists having become the gateway for the thousands cruising and disembarking at the port. * Editors note: The current offer price per double room at the Barcel� Raval before September 24th 2008 is 107 euros a night. The price then doubles, to match the prices of the five-star hotels in other parts of the city. A new luxury hotel, houses and parking area were planned for one of El Raval's poorest quarters - an area known as Illa de la Rambla del Raval delimited by the streets of San Rafael, Rambla del Raval, Sant Josep Oriol and Robador. The plan proposed 11,300 m� of new housing, 9,400 m� of offices, 9,300 m� of hotel and commercial space plus 556 underground parking places. Between 100 and 140 new houses would be constructed, 25% of which would be 'social housing', protected tenancies for existing local residents. One of the main stumbling blocks for the project was the height of the ten-storey hotel building - some 37 metres. The objective was to turn the building into one of the most representative (or characteristic) architectural pieces of the district of the Raval like the church of Sant Agust� or the Opera House. The Barcelona City Council also planned the transfer of the Catalan Films and TV film Library next to the hotel. The location was the 5,000 m� of land once occupied by Pla�a Salvador Segui. The Illa de la Rambla del Raval zone would also house the new General Workers Union headquarters. 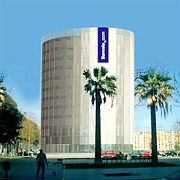 The Catalan Films and TV film Library project was planned to be completed by the end of 2006 and involved an investment of some 6 million euros. It would consolidate the work already completed aimed at 'mopping-up' the marginal inhabitants of El Raval which has included the construction of the Museum of Modern Art (MACBA) in the north of the district and the transfer of several other cultural facilities to the area. This new, avant-garde hotel complements its fashionable surroundings of the Rambla del Raval, in Barcelona�s cultural heart. The Raval has recently undergone a transformation to make it one of the city�s trendiest districts, with highlights including the MACBA contemporary art gallery. Take in 360-degree views of the surrounding area from the hotel�s roof terrace.